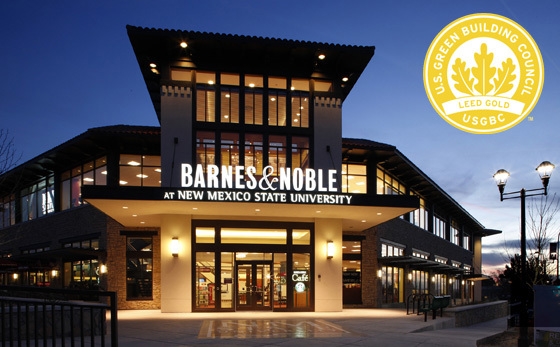 The New Mexico State University (NMSU) Auxiliary Services and Barnes & Noble at New Mexico State University building has been awarded the prestigious Leadership in Energy and Environmental Design (LEED) Gold Certification by the U.S. Green Building Council, the nation’s foremost non-profit organization dedicated to sustainable building design and construction. The 31,000 square-foot building was recognized for its energy efficiency, green technology and earth-friendly building practices used in its design and construction. This is the eleventh building in the NMSU system to be LEED certified, and the eighth to be awarded gold status. In 2000, the U.S. Green Building Council developed the LEED program to provide independent, third-party verification that a building, home or community was designed and built using strategies aimed at achieving high performance in key areas of human and environmental health, including sustainable site development, water savings, energy efficiency, materials selection and indoor environmental quality. LEED buildings are designed to lower operating costs and increase asset value, reduce waste sent to landfills, conserve energy and water, be healthier and safer for building occupants, and reduce greenhouse gas emissions. 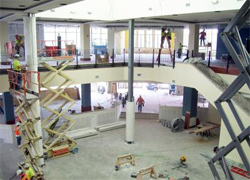 In 2006, former New Mexico Governor Bill Richardson signed an executive order requiring all future state-funded building projects of more than 15,000 square feet be built to meet LEED Silver standards. Since that order was signed into law, NMSU has met or exceeded that standard for all new buildings completed since then. Some of the features of a LEED certified building in New Mexico include highly efficient mechanical, electrical and water systems, connectivity to the community, efficient lighting, systems to lower greenhouse gases and xeriscaping, a form of landscaping that reduces or eliminates the need for supplemental water from irrigation.